Spray Polyurethane Foam (SPF) insulation roofs offer countless benefits to commercial building owners. For starters, SPF roofs provide waterproofing ability and long-lasting, resilient insulation. Other benefits include seamless, leak-free coatings and high insulation values, or R-values, high wind uplift resistance, as well as significant ROI with energy savings. Because spray foam roofs provide buildings with a lighter-colored roofing surface, owners can also dramatically reduce the level of air conditioning in their buildings. Finally, commercial spray foam roofs can be set up in a relatively short amount of time compared to other roofing systems. Since spray foam insulation can usually be applied directly over existing roofing surfaces, you can do away with the need for a full tear-down, which further reduces the time involved. In most cases, spray foam roofing requires less manpower than necessary for other types of roof jobs. Without question, commercial roofing supplies and equipment are essential to the entire practice of applied spray foam. To better understand why you need particular pieces of roofing equipment and supplies, it is important first to understand the steps involved in a spray foam roofing job. The installation process varies from project to project depending on the features of the existing roof. In most cases, a commercial roof application involves three phases, including preparation work, the actual application of SPF insulation, and finishing work. Part of the spray foam process involves transferring the roofing material’s components out of 55-gallon material drums; properly heating, pressurizing, and pumping those materials through hoses; and, finally mixing and spraying the components. Professionals apply SPF insulation roofs within a project’s specifications for a particular thickness, often in half-inch or one-inch layers. The product originates as a liquid and quickly rises in the form of foam in a matter of seconds. Amazingly, you can walk on the foam in a matter of minutes. While many roofing jobs require some of the same fundamental equipment as other general SPF projects, they commonly also need additional materials and supplies, ranging from roofing hoists to hand tools. A proportioning machine. Proportioners come in all shapes and sizes and are available from several manufacturers. There are some things to consider before purchasing one of these spray foam machines, including drive system type, output, pressure capacity, and more. Spray guns/heated hoses. Spray guns and heated hoses perform the most vital functions of the SPF application process. Depending on their functionality when the trigger is released, spray foam guns are available in three categories: mechanical purge, air purge, and solvent purge. Mobile spray rig. Spray rigs house all of the necessary tools and equipment you need for SPF roofing application into one portable package. Typically, contractors also keep their air and power utilities in their mobile spray rig, including a compressor and generator. Auxiliary equipment and spare parts. 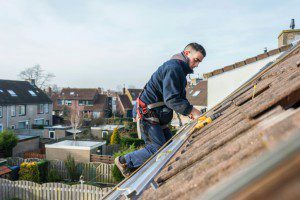 In any given SPF roofing job, you will often need additional equipment and power utilities. Various power tools are commonly utilized to prepare the substrates and perform set-up, operational, and completion tasks. Last spring, Intech Equipment & Supply featured a commercial roofing supplies “must-have” list on our blog. Shop the Intech Equipment & Supply online store for a variety of commercial roofing supplies and equipment from the top manufacturers in the industry. You will find everything you need to complete a roofing job from start to finish, from complex commercial roofing supplies to simple hand tools, and safety equipment. Visit our store today!